The National Centre for Sustainable Coastal Management (NCSCM) has been established by the Ministry of Environment and Forests, Government of India to develop world class knowledge base in India, related to management of the coastal and marine areas. 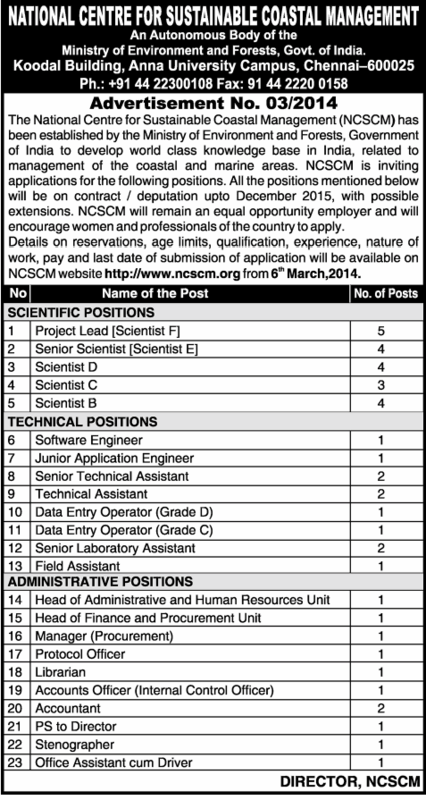 NCSCM is inviting applications for the following positions. All the positions mentioned below will be on contract I deputation up to December 2015, with possible extensions. NCSCM will remain an equal opportunity employer and will encourage women and professionals of the country to apply. Details on reservations, age limits, qualification, experience, nature of work, pay and last date of submission of application will be available on NCSCM website http://www.ncscm.org from 6’ March,201 4.